Blue skies and red earth. Kangaroos at dawn. Pelicans at sunset. Portee is steeped in history, being amongst the one of the earliest areas settled in South Australia outside the city of Adelaide. Situated in outback country. Portee is an easy 2 hour drive or 1/2hr flight from Adelaide. Portee has its own air strip named in honour of Edward John Eyre, an early South Australian Explorer. 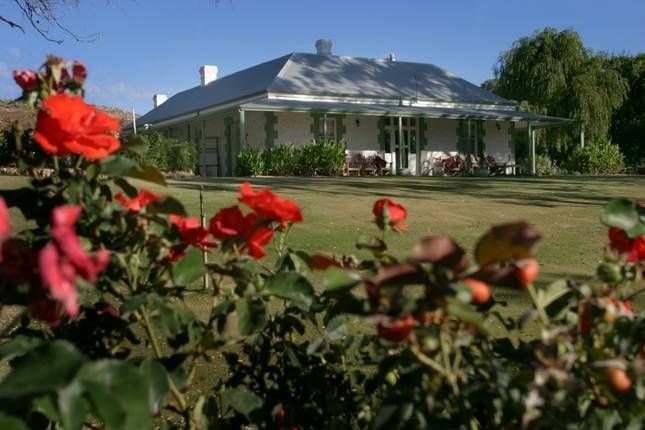 The homestead built in 1873 on the floodplain of the River Murray, is in the wetlands, allowing the abundant bird life that inhabit the slow flowing creek and age old river gums to provide a unique experience in a tranquil and restful setting. The Murray River fronts the property and the homestead has a private (Portee) creek surrounded by wetlands. The Murray River is accessible by 4WD for boating, jet skis, canoes and kayaking enthusiasts. A private area with slipway and pontoon. The perfect retreat for holidays, weddings, bucks and hens parties, birthday celebrations, spiritual gatherings, business training and team building, carers and carer recipients. The homestead offers exclusive hire of the homestead and surrounding property. Self cater accommodation or contract caterers can be organised. Portee is managed as a shining example of nature based tourism. Great accommodation for kayak, watersport, bushwalking and wildlife enthusiasts. Self cater in our full commercial kitchen or bbq facilities for special occasions or holidays with family and friends. We have a dining area to seat twenty and facilities to enable outdoor eating. Venue for Spiritual or Carers Retreat. Ideal for a spiritual retreat to allow time for reflection, prayer or meditation. Ultimate respite retreat for carers and carer recipients, for relaxing and convalescence. Venue for Weddings Or Special Occasions. A perfect setting for true Aussie weddings, bucks or hens show, birthday celebrations or any other special occasions to make your day an unforgettable experience. Business meetings, conferences and training facility. First settled in 1841, Moorundie the area that we now call Sandy Beach, is the site of the home of explorer Edward John Eyre, who was given the job of Protector of the Aborigines. Due to the sandbars at that point in the river it became a place to cross the river on the road to Sydney, eventually developed into the bustling township of Sturt, with a Police Station and Army Barracks, until a flood washed it away in 1870 and the town was moved to it’s present day site of Blanchetown. Portee Station now encompasses tourism for international and domestic guests. Fantastic spot to relax with family and friends!! Great location and facilities, everything you need is there including the Kenwood chef for some holiday baking!! The homestead was clean and maintained with a homely feel. A little bit tricky to access the private boat ramp if you don’t have a 4wd but it made for a great little adventure! Lots of space outside for the kids to run and parents sit by and relax and far enough back from the water and pontoon to know they’re safe. We all loved the visits from Max the border collie too!!! Great hosts who were good at replying to all our questions prior to our stay and a helpful tour of the place whilst we were getting settled in!! Thank you for your review of Portee Homestead. As hosts you were exemplary guests and left our homestead in a clean and tidy state, it was appreciated. Max our Border Collie thoroughly enjoyed playing with the children and came home exhausted. We would love you to return. Loved our stay. Well maintained property. Plenty of space for everyone, well equipped, plenty of beds, beautiful homestead, well restored. Loved the dog. Would definitely recommend and will go back again. Best wishes to you and your family for a wonderful New Year in 2019. Extremely happy that you enjoyed your family get together at Portee Homestead for Christmas. Looking forward to your return to Portee. Difficult to make contact with owners leading up to stay. However, house was great, and rooms clean. Open fire in lounge provided a toasty feel. "Max" (dog) was a pleasant surprise and well-behaved. Pity it was so dry at the time we were there but cant really do much about lack of rain. Our group of 19 - simply did not want to leave! Everything was just perfect, ensuring an amazing and memorable weekend. This is our second year in a row that we've stayed at Portee station! We absolutely loved it..the big communal lounge/dining room. Its great that every room has it's own bathroom too. Our kids loved the freedom of the outdoors that the homestead has to offer & then the bonfire underneath the stars just topped off a wonderful weekend away. We will most definitely be back!! We stayed at Portee with 3 other couples and 9 children. The host were friendly and generous with their time. The house easily catered for our need for space, privacy and equipment. Each bedroom having its own ensuite was a lovely luxury. The beds and linen were of very good quality. The setting on the creek, the garden, the shearing shed games room and Max the visiting kelpie made our stay perfect.